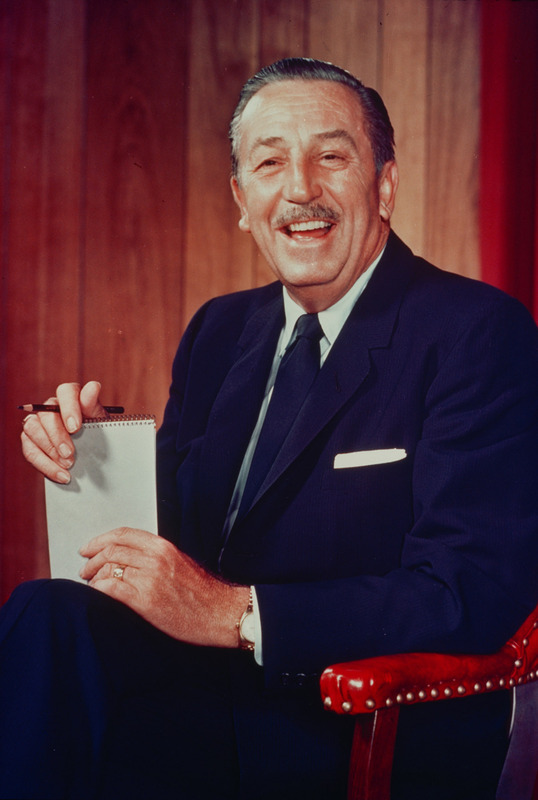 I don’t know about you but when I plan a trip to Walt Disney World, Fast Passes and Park Days are often planned around where we can get dinner reservations. It doesn’t make a lot of sense to plan your day at the Animal Kingdom when you have ADR’s (Disney speak for Advanced Dining Reservations) for lunch at SciFi Dine-in Theatre. So a big part of the structure of how the day will unfold is based on where you might want to eat and where you can get Dining Reservations. Walt Disney World has a lot of great places to eat so your second choice is often as good or better than your first. My Countdown for Disney app still has too many days to start planning when meals will happen on our upcoming trip in December, but we can still dream about the options before us and figure out what the “don’t miss” meals are and the “I like it but I can give it a miss this trip” meals are. As each park offers lots of different fare then it might be worthwhile taking a look at each park and where some of the best places for nosh exist. Let’s start with the Magic Kingdom. To be honest, My family has only eaten at a few of the restaurants in the Magic Kingdom. Many of the dining packages offered by the restaurants in some of the other parks that have major events don’t really exist in the Magic Kingdom. I know of a few desert parties that are held with the Fireworks. Since this is the only really big show in the Magic Kingdom and the view of the fireworks is pretty spectacular anywhere in the park, we have only done one desert party. We took a cruise on the 7 Seas Lagoon and watched them from the lagoon in front of the Magic Kingdom. As you probably already know from reading some of my previous blogs, my family tended to travel in packs. Numbering from 7 to more than 15, we would invade one or more of the DVC resort villas and have a wonderful immersive Disney experience. 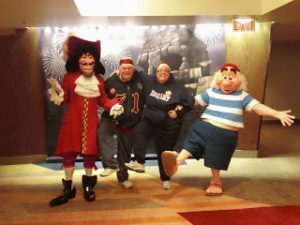 One of these quests for Disney fun resulted in our qualification for a Grand Gathering Breakfast at Tony’s Town Square Restaurant. I don’t think that the Grand Gathering breakfast even exists anymore but at that time, the grand gathering breakfast included a character breakfast with the typical Disney breakfast fare and a meeting with some of the Characters. I probably got more out of it than some of the kids that were at the party. I got to dance with and sing to Minnie, a memory I will keep forever. However, the food was not stellar. Our meal was hot and who doesn’t like Mickey waffles, but one can only eat so many scrambled egg breakfasts and at that time wimpy un-crispy bacon was pandemic throughout all the Disney restaurants. In spite of the fun we had at the Grand Gathering Breakfast, some of the reviews have kept us from going to Tony’s for a regular meal. From what I gather, there are better places to get Italian food. My personal favorite is in Epcot but we will cover that later. Tony’s Town Square Café is a single credit on the dining plan and expect to pay around 30 to 40 dollars for the full meal deal if you go in paying cash. I suspect, for my family and I, we will be visiting other locations for Lunch and dinner. Here is a link to Tony’s dinner menu. 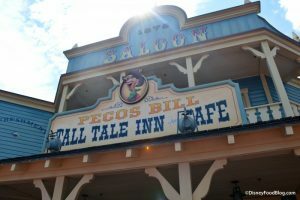 We have had a couple of very good meals at Pecos Bill’s Tall Tale Inn and Café. What I love about Pecos Bills is the fixin’s bar. I loved the taco salad with stuff from the fixin’s bar. Our Family enjoyed topping our salad’s with Cheese, Pico de Gallo, tomatoes and mushrooms making our salads very tasty indeed. I believe the menu has been tweaked since I’ve eaten there and the new menu includes entrees like Fajitas and Jerk Chicken Lettuce Wraps along with old standbys like burgers, Nachos, and salad. Pecos Bill’s Tall Tale Inn and Café is a single Quick Service Credit on the Dining Plan. Pecos Bill’s is located in Frontier land and has a lot of seating on several levels. Even so, at least once, we had to wait a bit to find a place to sit at the restaurant. Pecos Bills is very popular and since it is a quick service restaurant, there are no reservations. I can’t imagine what the crush would be like during the more popular times of the year. Believe me, however, the food and the air conditioning are worth a few minutes wait to get a seat. Here is a link to Pecos Bill’s menu. 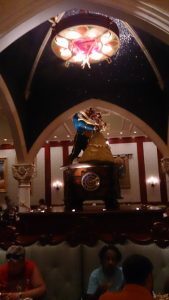 Cinderella’s Royal Table was the only signature restaurant in the Magic Kingdom where my wife and I have eaten. This restaurant features a meet and greet with most of the Disney princesses. Meeting the princesses was fun as they came to each table during the meal. When my family went to Cinderella’s Royal Table, Jasmine was still wearing the outfit she wore in the movie so, while I didn’t feel uncomfortable, there was a little bit of blushing when she came over to the table. I understand that Disney has a family-friendly image to protect but I am not sure that changing Jasmin’s outfit was needed. To put a Geek spin on the argument, I think Jasmine’s new outfit is out of canon. Of course, Disney gets to decide what is in and out of canon since Aladdin is their property. The grand entrance of the princesses was marked by a ceremony, announcing each princess as they entered the room. It all felt very Chivalrous. Each visitor was greeted by Cinderella herself before ascending into the service area. After all, Cinderella owned the Castle so it felt right that she would greet visitors as they entered. Our visit to Disney World that year featured many meals with braised meat. I had the pork shank that was tender and flavorful. I could tell that a lot of care had gone into the preparation. But to tell the truth, I wanted to love Cinderella’s Royal Table. I just couldn’t bring myself to love it. The food was good but not the best I’ve had in Disney World. The cost of the meal was significant running at over 50 dollars per person or 2 Dining credits. We were thrilled to get the ADR’s for Cinderella’s Royal Table and I don’t regret dining there. I think everyone should experience Cinderella’s Royal Table during one of their visits to the Magic Kingdom. Visitors get to dine with some of the most iconic characters in the Disney catalog. Should you go at least once? Absolutely! Do I need to go again? I don’t think so. Dining at Cinderella’s Royal Table was a once in a lifetime experience that I only need once in my lifetime. You can find the Menu for Cinderella’s Royal Table here. The last peddle hasn’t fallen yet! Really, the only other place in the Magic Kingdom that my family has eaten was at “Be Our Guest” in the new section of Fantasy Land. We have never been able to get Dinner reservations at “Be Our Guest”. We did, however, get to participate in a pilot program a few years back that allowed us to get ADR’s for Lunch. 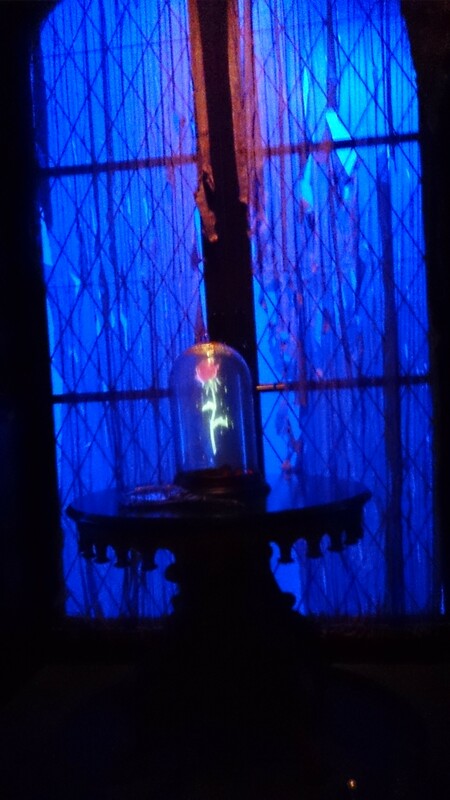 We were lucky enough to get breakfast ADRs at “Be Our Guest” the last time we visited the park. Not long after the Magic Bands were issued, we had our lunch there. We enjoyed the food at the restaurant and one of the highlights of the meal was the “Grey Stuff”. It really was delicious. The “Gray Stuff” is an Icing on a small cake and tasted very good. We have not had the chance to eat at “Be Our Guest” for quite a while, yet, I remember having the Braised Pork which was chocked full of flavor. (There he goes getting braised meat again.) My wife had a sandwich which she really enjoyed. On our breakfast adventure, we had an assortment of pastries that were very nice. While the food was good, and I enjoyed the interior of the restaurant as much as the food. Also, as Arthur C. Clark third law states “Any sufficiently advanced technology is indistinguishable from magic.” How the food arrives at your table, is pretty magical. Our table had pre-ordered our food before we arrived at the restaurant. We found a table and soon after we were seated, the food arrived without any interaction with a terminal or the wait staff. I’m sure that the staff was able to locate us with our magic bands but even so, It looked a lot like magic to me. Now, this may have changed but when we went a number of years ago, we were able to get lunch and breakfast for a Quick service credit each. 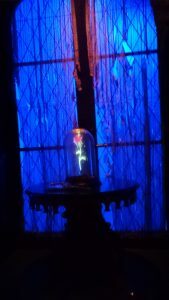 At one time Dinner at Be Our Guest would cost you only a single dining credit but as of July 2018, the experience was upgraded to a signature meal requiring 2 credits. My Wife and me at the Pirates Fireworks Cruse. The jokes were corny and the views of the fireworks were amazing! This blog doesn’t cover all the places to get food in the Magic Kingdom. Casey’s Corner is pretty famous for their hotdogs and the LeFou’s brew at Gaston’s Tavern is wonderful if it weren’t for the brain freeze. The Crystal Palace has Character Meals and the Liberty Tree Tavern serves AYCE Thanksgiving dinner year-round that features Turkey, Pot Roast and Oven Roasted Pork with all the trimmings. I haven’t eaten at these locations but maybe it’s time to try them. Thanksgiving is one of my favorite meals of the year. Even though I turn 60 this March, I still love spending time with Winnie the Pooh. 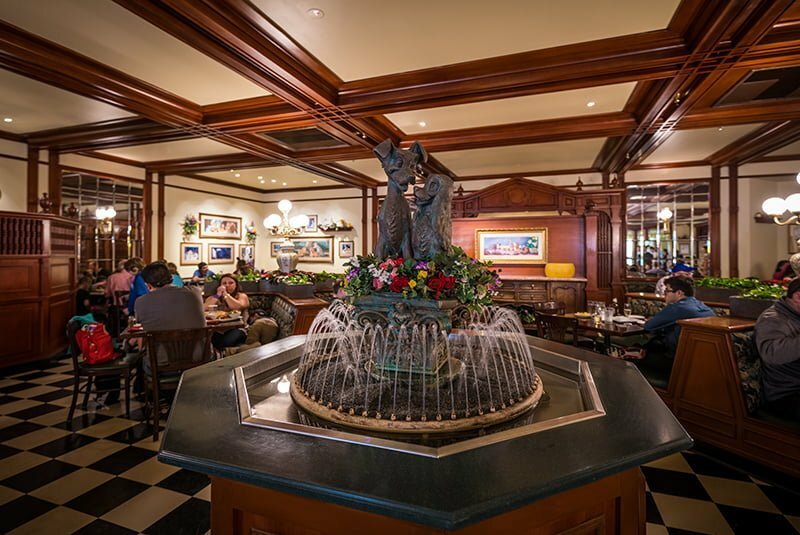 All the Characters from Winnie the Pooh are among my wife’s favorites and can be found at The Crystal Palace at breakfast, lunch at dinner. I am sure that there are other eateries tucked away in the Magic Kingdom that would deserve more of my attention and I can’t wait to seek them out. Once again, I have picked a topic too big for a single blog. Next month, we will take a look at the food in Hollywood Studios. 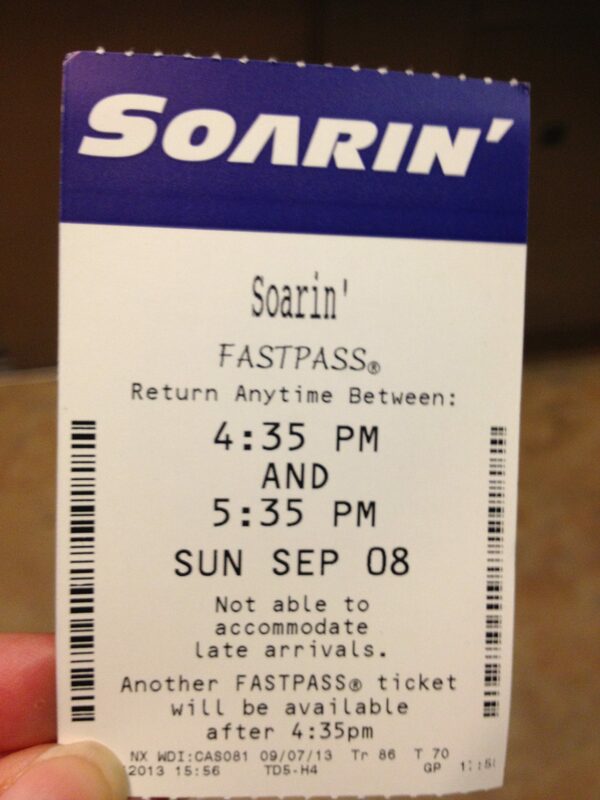 Then on to EPCOT and Animal Kingdom in later months. We will finish the topic with restaurants that are not in a theme park. Picture credits. Pecos bill’s – Disney Food Blog, Tony’s – Disney Tourist Blog. Over the years my love for Disney has grown. 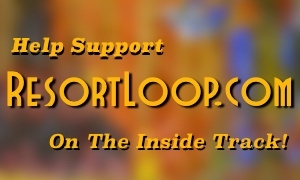 I have visited the parks a number of times and learned some Disney lore that I hope to share. I love to travel and am a bit of a foodie. Also, I am a singer (Mostly Classical stuff) and I've been known to play the odd Video Game from time to time. 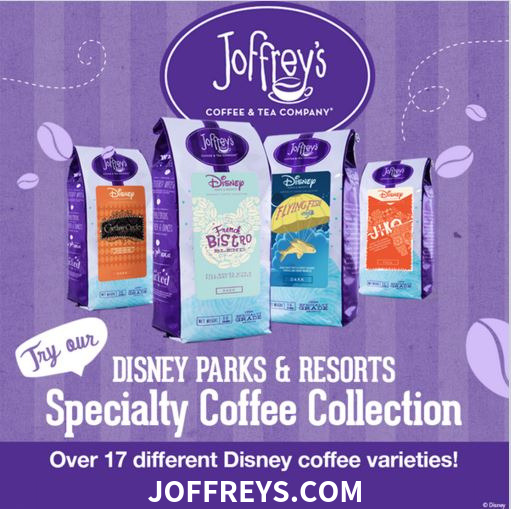 Walt Disney World’s Kids’ Meals!